The leader of the Revolution and the first head of the Soviet Union died in 1924 - but Lenin was not buried in a cemetery. 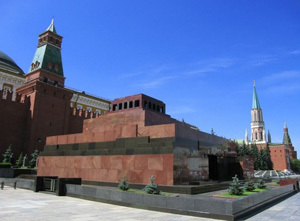 The Soviet government came up with the most unusual idea: his body was embalmed and a granite mausoleum was constructed for him on Red Square. Lenin's tomb has echoes of the ancient pyramids. Belief in an afterlife, combined with their knowledge of embalming techniques, led the Egyptians to construct pyramids to immortalize their rulers. The Soviet government may have been atheist but they believed in the afterlife of Lenin's ideas. His body was placed in a glass sarcophagus, and thousands of people came to see it each day. Lenin was immortalized by Soviet propaganda. The first mausoleum was constructed from wood. In 1924, no one was certain if the embalming process would be effective or long lasting. The government wanted to maintain the body for several months, which would allow people from all over the country to see Lenin. After some time had past and the embalming technique was proven to be reliable, it was decided to keep Lenin in the mausoleum forever. The architect Shusev constructed a new stone building in 1930. Lenin's mausoleum was not only used as a tomb. A stand was constructed on the top, enabling the communist party leadership to watch the parades. Ceremonial events were held there. The changing of the guard outside the mausoleum became a popular attraction with visitors. Yet Lenin is not the only person buried on Red Square. There is a necropolis near Lenin's tomb where the pro-Bolshevik victims of the October Revolution were buried in mass graves in 1917. When Stalin died in 1953 he was also interred inside the mausoleum, his sarcophagus placed beside Lenin. His body was removed from the tomb in 1961 when Khrushev denounced his crimes. Today, Stalin is buried behind the mausoleum with other Soviet rulers such as Brezhnev, Andropov, and Chernenko. Recently, there has been some debate about what should be done with Lenin’s tomb. Perhaps it is time to remove Lenin's body and have a proper funeral? Or should we keep the mausoleum as part of our history? It's very hard to find the right answer. For now, it's still open. The tomb – and Lenin’s body - can be viewed between 10am and 1pm every day except Monday and Friday. You can visit the mausoleum with your during your Moscow private tour.